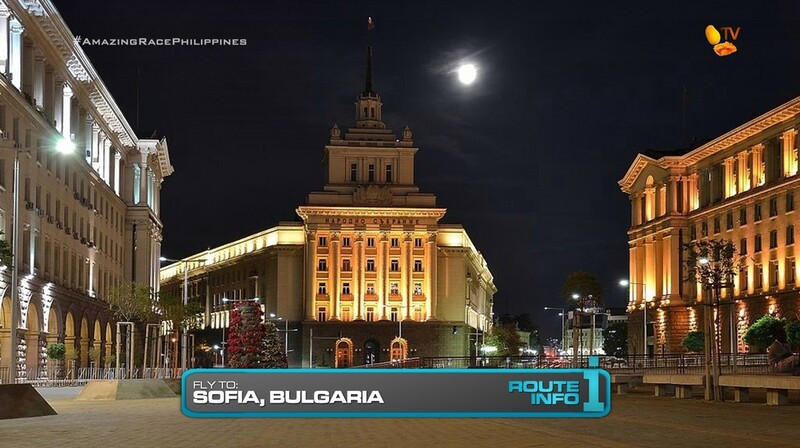 It’s time for the 8th Leg of the Race and teams will be flying to Sofia, Bulgaria! All teams will be on the same Iberia/Bulgaria Air flight arriving in Sofia at 11:55pm. Once in Sofia, teams must take a taxi to the Kalofer Monastery where they will be spending the night. They will be given their next clue at 7am. Bright and early, teams will open the clue to find a Duel Duel! 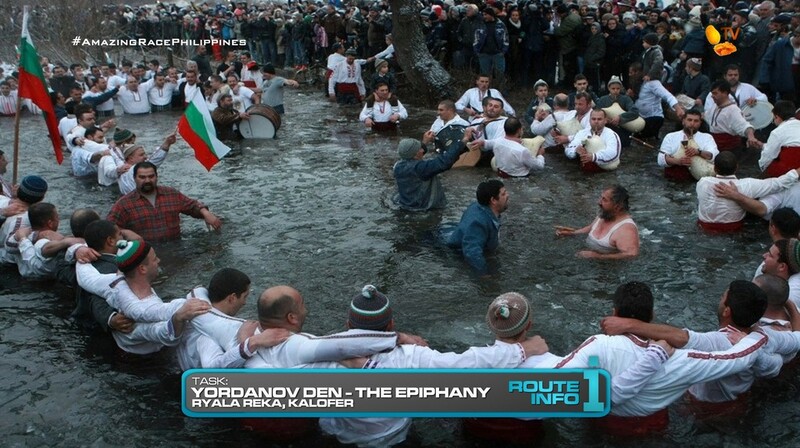 The annual celebration of the Epiphany sees Bulgarian men take a dip in the icy waters across the country. For this Duel Duel, teams will brave the cold waters of the Ryala Reka as they fight to catch one of six wooden patterns that will be thrown into the river. This is inspired by the traditional custom in which a priest throws a cross into the water for the men to catch on the feast of the Epiphany. Teams will need to keep this wooden pattern with them until further notice. And once teams manage to fight off the other teams for it, they will receive their next clue. 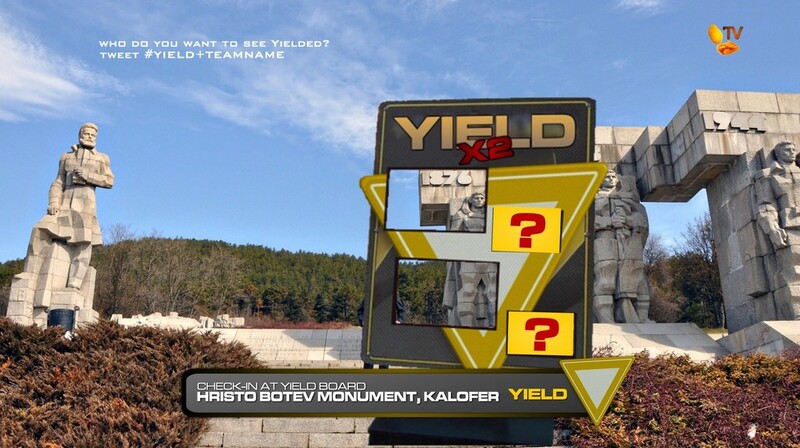 Teams can now hop into one of the waiting taxis to take them to the Hristo Botev Monument in Kalofer. Here, teams will find a Blind! Double Yield board! The Super Yield, if still available, may be used here. 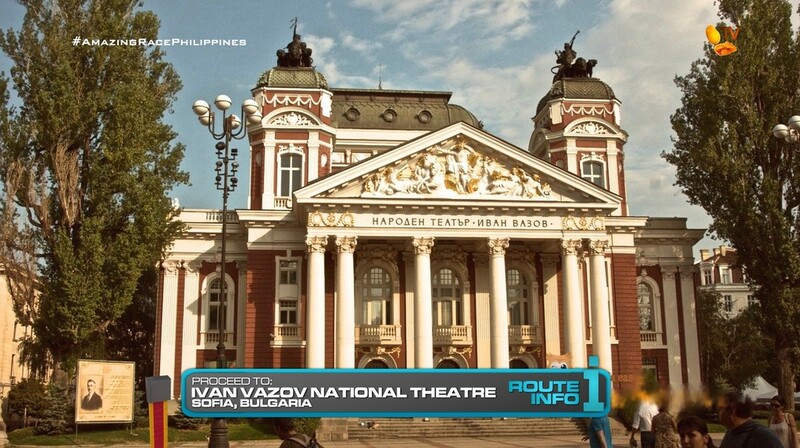 After checking in at the Yield board, teams will head back into Sofia and look for their next clue outside the Ivan Vazov National Theatre. And that clue reveals the Detour: Cryptic Cyrillic or Making Martenitsas. 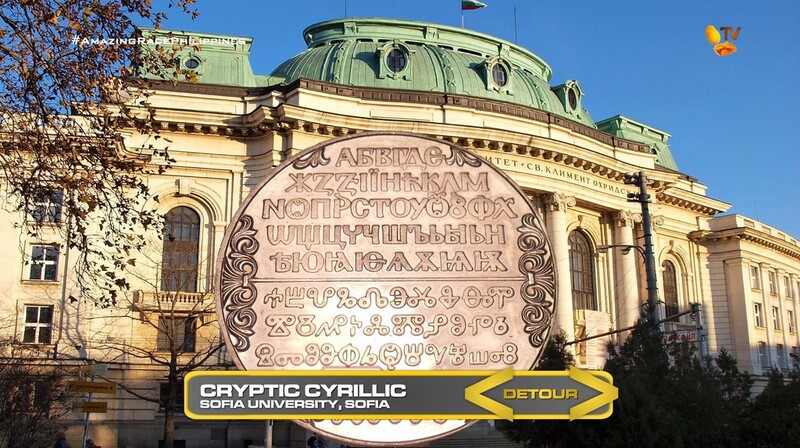 In Cryptic Cyrillic, teams will make their way to library of Sofia University where they must correctly rewrite a message inscribed on a medallion in cyrillic which was invented in Bulgaria. Once they have correctly copied the text, they must then ask someone on the street to translate it for them. Teams will then need to do whatever it says to receive their next clue. 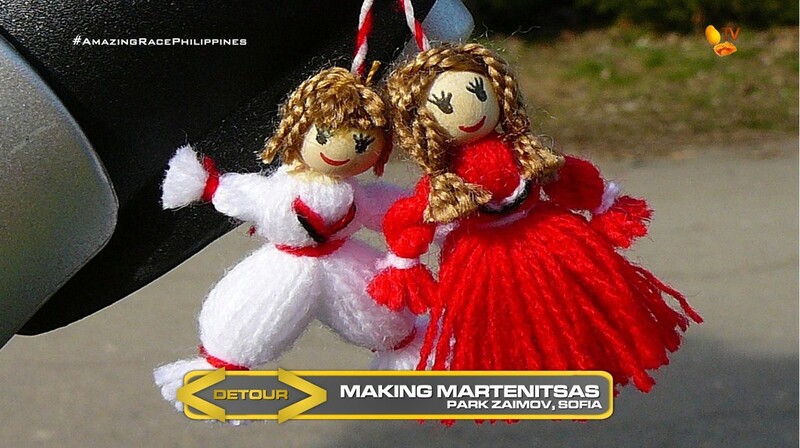 In Making Martenitsas, teams must head to Park Zaimov where each team member must make two martenitsas each. Team members will each keep one of the good luck charms while selling the other to a local. Once they’ve correctly made and sold their martenitsas, teams will receive their next clue. 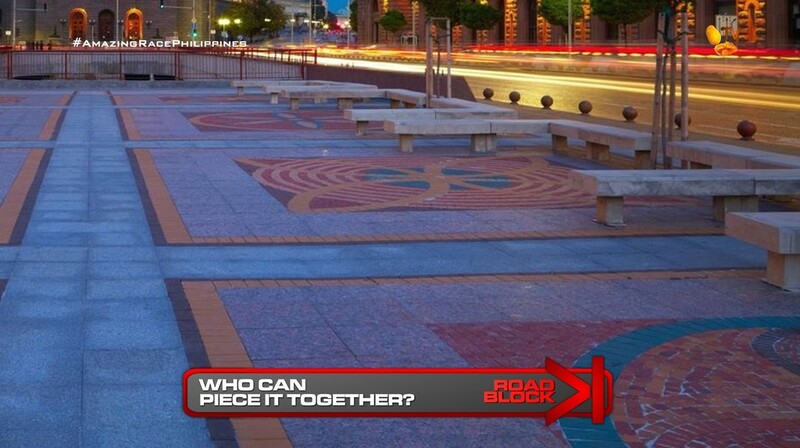 Teams must now make their way to the Largo where they will find the Road Block: Who can piece it together? For this Road Block, teams will refer to the wooden pattern they obtained from the Duel Duel in Kalofer. They must find which of the eight patterns on the ground of the Largo plaza matches theirs. They must then piece together a large puzzle matching that pattern. Once completed, both team members must then deliver the finished puzzle to the Ministry of Education in the Largo to receive their next clue. 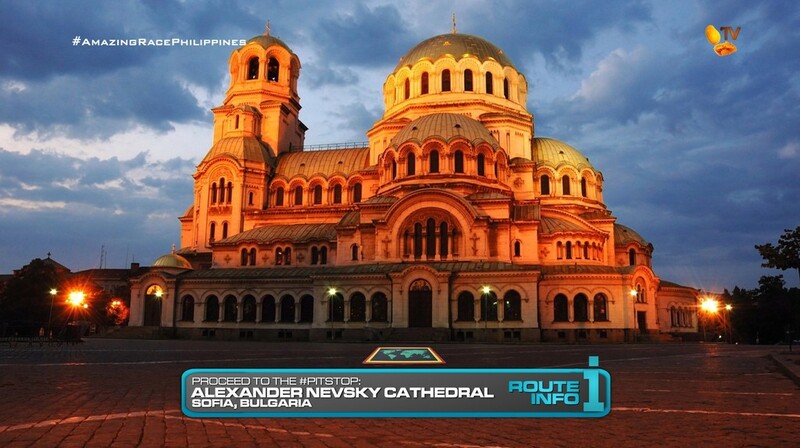 And that clue directs teams to the Pit Stop, the Alexander Nevsky Cathedral. Woohoo! TARPH gets to visit a new-to-TAR country in Bulgaria! 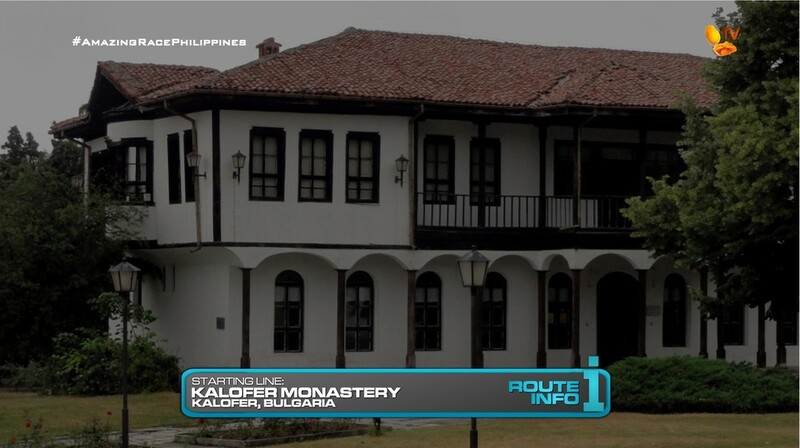 The overnight stay at the monastery is good since teams will be arriving at midnight in Sofia and the location of the Duel Duel will be nearby next morning. And morning is the perfect time for an icy dip in the river. The tradition is very interesting. And apparently only Bulgarian men do it. But for TARPH, the women will be able to fight for the wooden piece too. And things shouldn’t get too physical anyway. The will be the last opportunity to use the Yield on the Race. I like the Detour. Both are cultural tasks for Bulgaria. The Cyrillic is a good language task. And the martenitsas is one of those tedious, time consuming tasks that some might think is easier than the language. 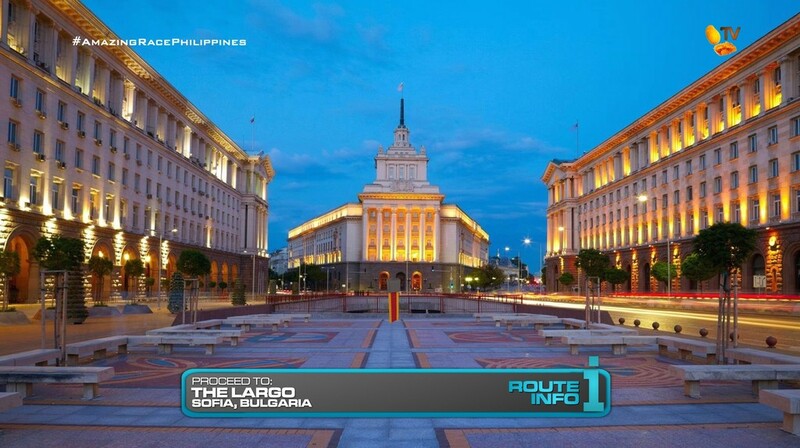 The Largo is a must-visit in Sofia, I guess. And those patterns on the ground would make for great puzzles. This season doesn’t have any puzzle tasks, so this would be a good spot. And the Alexander Nevsky Cathedral looks to be one of the most iconic landmarks of the city, so Pit Stop it is! And this is the last Non-Elimination Leg of the Race. I think it’s an okay spot. I prefer having the last few Legs be elimination Legs. I’d say a pretty solid Leg in a new country!